The final casting of the preparations is no different to that for larger bridge work. 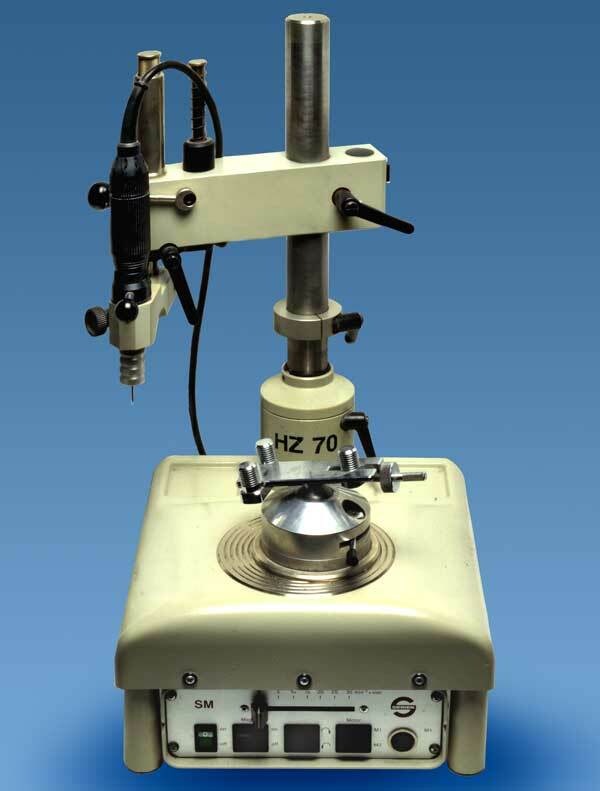 The milling model is produced as usual then based on the model. The optimal alignment position for the attachment is determined such that the rods on the male attachments are aligned parallel to one another. In order to protect the attachment from overloading by tension and pressure forces, each component is protected from these forces via a stress breaker: this avoids breakage of the male element or expansion of the female one. A horseshoe-shaped depression is milled into the crown(s), which has vertical grooves milled at either end. This prevents movement of the attachment along the sagittal axis. The ledge of the milled horseshoe depression is able to absorb axial pressure and distribute it over the crown block. The stress breaker then fits snugly into this milled groove and rests on the ledge. The grooves and ledges are already incorporated during wax modelling and are pre-milled with special wax mills. 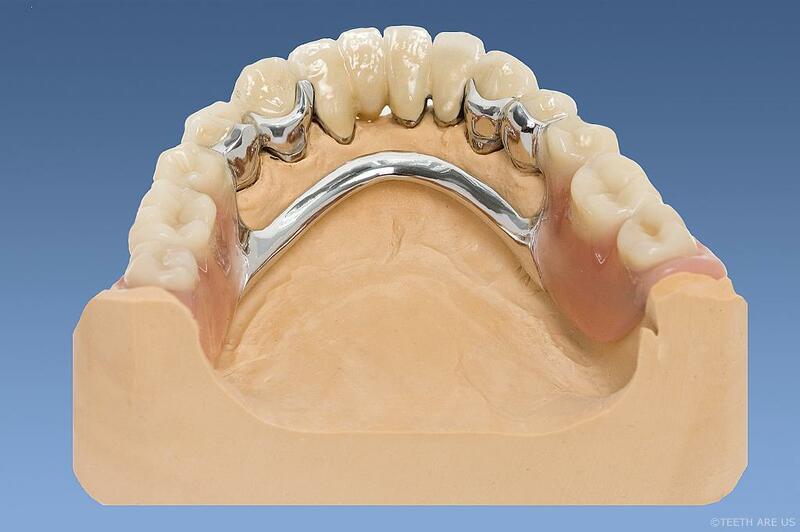 The cast crowns then proceed to the first fitting and the coping impression in the dental practice. The crowns are returned to the lab with the over-impression from which the master model is created. 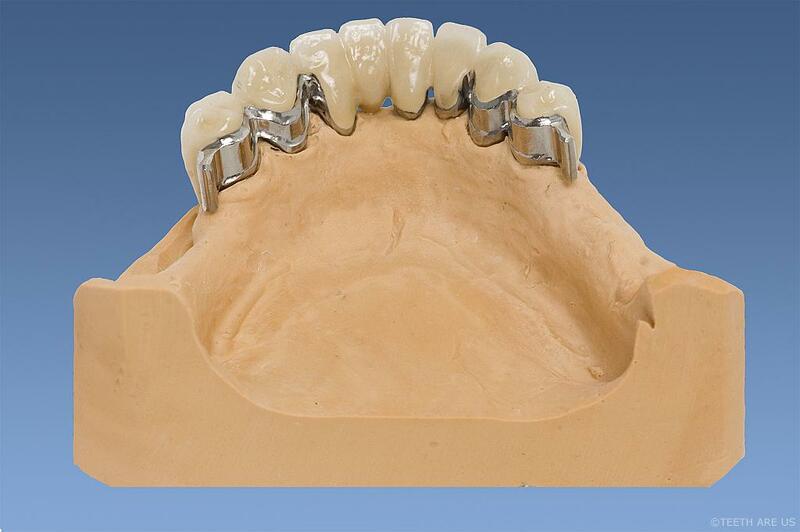 The abutment crowns are shaded with ceramics. Due to the expected oxidation during the firing of the ceramics, it is only possible to mill and polish the surfaces afterwards. It is a great help at this juncture if the dental positioning has been established previously. After firing, the crowns carrying the attachments are transferred with a key to the milling plate (made out of plaster of Paris or an appropriate holder). The milling plate now determines the position of the attachment. All the milling surfaces previously cast in wax are then milled and polished. All milled planes are now absolutely parallel.The grooves and ledges are already incorporated during wax modelling and are pre-milled with special wax mills. The milling plate now determines the position of the attachment. All the milling surfaces previously cast in wax are then milled and polished. All milled planes are now absolutely parallel. The Teflon female component for each tooth is shortened, as required, to fit the attachment’s length and is applied to the male component. Undercuts are filled with wax. 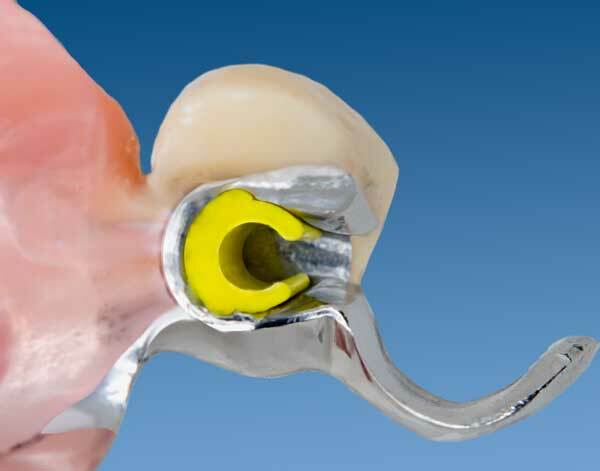 Here the female attachment cap also acts as a spacer – so do not interchange! Further casting proceeds as usual and the work is ready for the production of the model cast. The casting of the grooves, ledges and attachment components must be bubble-free. As with the production of telescopes, the handling of the model and the casting materials require considerable experience in order to get a really good fit of the stress breakers and the base of the cast. The insertion of the female components (usual colour yellow) into the cast is facilitated by a special tool which is included in each package. Insertion of the female component into the model cast should be possible using light pressure. If it is too loose, then it will fall out later: if too tight, then the whole model could be lifted or the patient cannot remove the prosthesis. The walls of the female part should be parallel, sitting completely within the model. Otherwise the metal frame needs to be reworked. The conversion of the wax model into methacrylate does not require any special effort; however, one should not forget to protect the attachment from unwanted intrusion of the resin by blocking with wax. The housings for the female components are coated with composite, rendering the attachment invisible. It is advisable to have a notch close to the attachment, in the resin of the prosthesis, where the patient can find a hold with a fingernail for easier removal of the prosthesis. Small beads of clear plastic applied to the prosthesis can fulfil the same objective. 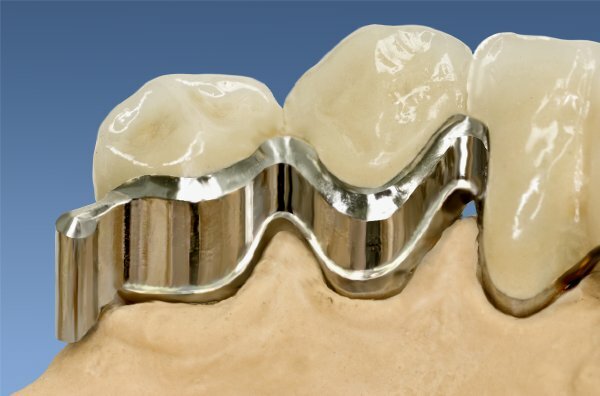 Generally, Rod attachments and similarly constructed attachments require a bordering gap in order to incorporate an extracoronal attachment. 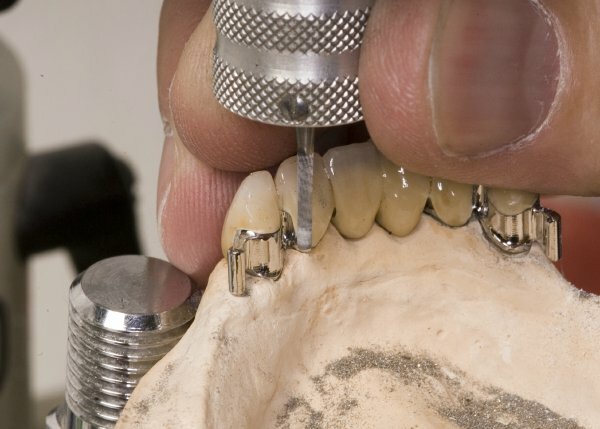 If the construction requires an attachment point in a still-complete dental row, then a groove-shoulder attachment can be used.